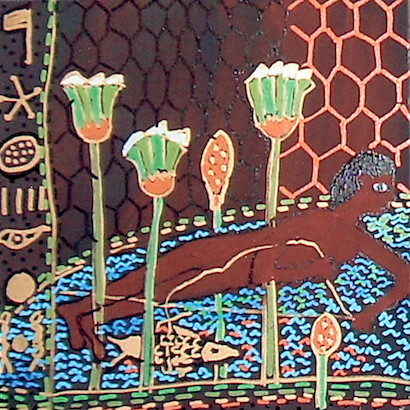 Adu Gindy's love of Egyptain Art led her to use Egyptian wall-paintings as an inspiration for this body of work. These "Imaginary Hieroglyphics" were the focus of a major exhibition at The Tweed Museum of Art in Duluth, Minnesota. "Fables and Pyramids: Adu Gindy, Joy Kops and Peter Weizenegger"
In 2007, Suzanne Szucs interviewed Adu about the show she was preparing at that time for the Tweed Museum of Art, an exhibit which encompassed the death of her longtime partner Kamal Gindy.